There was drama even before the race began as Max Verstappen spun on the opening lap as he tried to warm his tyres with Robert Kubica doing the exact same moments later. The track temperature was roughly 10′ cooler than Saturday’s qualifying. 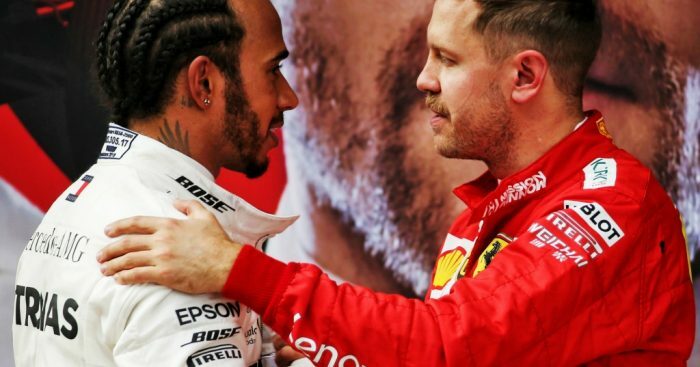 As the race begun Hamilton took the lead off pole-sitter Bottas while Leclerc got the jump on Sebastian Vettel. Behind them, though, there was yet more drama as Daniil ‘Torpedo’ Kvyat hit not one but both McLarens. Carlos Sainz pitted for a new nose, a very long stop, while Norris came in for fresh tyres. He was told a lap later that there was “damage to the floor” of his car. Kvyat was handed a drive-through penalty, taking it on lap 8. The VSC came out for the marshals to clear the debris from the crash, however, it may not have been cleaned up entirely as a short while later Hamilton reported that he hit something. That did little to slow Hamilton’s pace with the Mercedes driver pulling away from Bottas who in turn put distance between himself and the chasing Ferraris. Then told to let Vettel through, he did so at the start of lap 11. Vettel immediately began to pull away from his team-mate by only by a little bit. Leclerc wasn’t happy with the call and let Ferrari know that he felt his race had been compromised for Vettel. While Ferrari squabbled, over the radio if not on the track with the 21-year-old telling the Scuderia “I’m losing quite a lot of time. I don’t know if you want to know or not, but just to let you know”, Hamilton and Bottas continued to pull away from the Ferraris. And Verstappen began to catch them. Nico Hulkenberg became the race’s first retirement as he pulled into the pits and parked his RS19 on lap 18 with what looked like yet another mechanical problem. Back at the front Verstappen was the first of the frontrunners to pit, swapping his medium tyres for a set of the hard Pirellis. He came out P8. Vettel came in a lap later and emerged just ahead of Verstappen. The Dutchman dived down the inside at the hairpin with the two coming out side-by-side. Vettel stayed ahead. Bottas was the next in, stopping on lap 22 for hard tyres, with Hamilton in from the lead a lap later. He also swapped his mediums for hard Pirellis as too did Leclerc. The top six lined up Hamilton, Bottas, Vettel, Verstappen, Leclerc and Gasly. But, having had the undercut, instead of being four seconds behind Hamilton, Bottas was 1.5s down on his team-mate and flying. Hamilton responded by upping his pace, building his advantage back up to more than four seconds. Vettel was eight behind Bottas with Verstappen a further eight behind him and Leclerc four behind the Red Bull and closing fast-ish. The second round of pit stops saw Verstappen come in first followed by Vettel, Hamilton and Bottas – the latter being stacked behind his team-mate in a double stop. The Finn wasn’t slowed any more than he had to for the mandatory 80kph in the pit lane. Gasly was the next in while Leclerc again ran longer than his rivals and spent a few laps holding up Bottas. He eventually stopped on lap 42, a stop that was slightly longer than it should have been as he didn’t leave the pits the split second the light went green, for soft tyres thus giving him a a pace advantage in the final stint. But 14s behind Verstappen and with just 14 laps in hand, it remained to be seen whether he could catch the Red Bull driver. Meanwhile Hamilton continued his stroll to the victory, his sixth win in Shanghai, while Bottas made it a Mercedes 1-2 as he took the chequered flag ahead of Vettel. Although Leclerc closed the gap to Verstappen, it was marginal and he never came close to challenging the Red Bull. Verstappen was P4 to the Ferrari man’s fifth place. Gasly finished a lonely P6 with a late pit stop handing him the point for the fastest lap of the race. It was his best result for Red Bull Racing. Daniel Ricciardo was a distant seventh for Renault but finally finished his first race with his new team and did so in the points, best of the rest. Sergio Perez, Kimi Raikkonen and Alexander Albon completed the top ten. Albon scored despite starting the race from the pit lane after not taking part in qualifying following his massive FP3 shunt.